Our high end Professional Series HEMI short blocks are the most popular choice for our SRT-8 owners who want the best engine, whether for the track or for daily street use. This custom 392ci SRT-8 Stroker built exclusively for HHP by Tony Bischoff and BES Racing Engines (Winner of the 2006, 2007 and with a Gen 3 HEMI, the 2010 Engine Masters Challenge) is one of the best street and strip racing engines available for all NA and supercharged, turbocharged or Nitrous injected vehicles. Designed to easily handle over 1000 horsepower without upgrades, combine it with our HHP/BES Ported & Polished Heads, custom HHP/BES Stroker camshafts and you're on your way to having a fully streetable car you can both kill the competition on the track and confidently drive across the country and back with no issues. As with all of our motor packages, with HHP you are not just receiving an awesome engine package, but you are getting our expert tech support which runs 16 hours a day, most days. We are here to make sure you are another great HHP success story. Your satisfaction depends on it. *ATI Damper not included but recommended with your shortblock purchase. Balanced & Blue Printed: All blocks are sonic tested for integrity and thickness. All engines are professionally balanced and blue printed. Blue Prints available to customers upon request at time of purchase. Optional Upgrades: Recommended for High Compression strokers, Low Compression strokers built for 20+ psi boost, Low Compression nitrous injected strokers seeing over 15psi boost, and Nitrous Engines with intentions of using over a 350 shot, combined total. For More Information: Please Call Us at 888-894-1115 for more info regarding this engine and what you will need to successfully complete the transformation of your vehicle into one of the baddest vehicles the HEMI world has ever seen. Let our experts help you plan out your build. 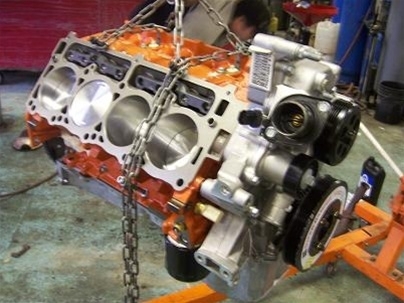 At HHP, we carry EVERY part you will need to complete your entire stroker build, and since we are a chain of installation shops as well, we can provide everything from inhouse installation and tuning to tech support and email tuning for the do-it-yourself mechanics. Warranty: 3 Year/36,000 Mile Limited Warranty applies to all HHP/BES engine products. BES stands behind their work and after years of working with the number one engine shop in the country, we can vouch for their work as we have never had a motor come back due to an assembly error. NONE of our competitors can say this. All part manufacturers limited warranties apply as well. We recommend you check out our track record and you will not find one unhappy HHP/BES stroker customer. What we don't warranty is damage caused my installation mistakes by unauthorized installers, damage caused by non-HHP tuners, damage caused by use of inferior or non-recommended parts, damage caused by idiotic abuse or neglect, damage caused by stupidity, and on the same level, damage caused by listening to the advice of your friends. Race built motors are just that and our 1000+ hp customers understand that any motor producing high hp will need freshening over time to keep it performing at it's maximum potential. Special Offer: As a courtesy, HHP will provide a baseline startup tune when purchasing a stroker, camshaft and recommended injectors. We also provide a discounted email tuning package by our professional tuners.